Or, more accurately, the hi-Sun has speakers added on. The base of the hi-Sun is a standard towel. Onto that is added a headrest with an inflatable pillow. The headrest is quite comfortable and also doubles as a backpack. Those qualities alone make the hi-Sun a rather good beach towel. As for the speakers, the sound quality isn’t overly impressive—you wouldn’t want to rely on a hi-Sun to provide music at a beach party—but given that the speakers are directly behind your ears when laying on the headrest they needn’t be particularly loud. 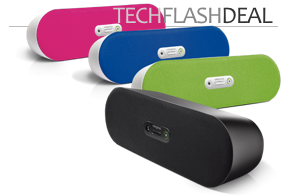 The water resistant speakers are powered by a lithium battery that’s rechargeable via a USB port. A universal 3.5mm jack attaches to the speakers, letting you hook up an iPod or most any other MP3 player. We imagine that most music-loving beach goers would opt to get a regular beach towel along with a pair of basic waterproof earbuds (like the H20 Surge 2G). 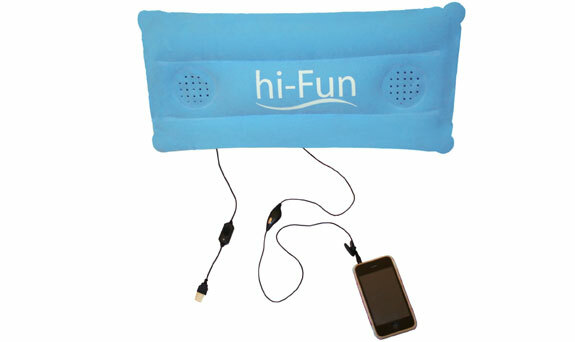 But there is something cool about the hi-Sun’s speaker-towel combo. The hi-Sun isn’t sold anywhere in North America that we could find, but is available in Europe. It ships internationally from Shoxx in Luxemburg and from Amazon UK, Amazon France and Amazon Germany.